Oh my! If this is true, that’s a major concern! I normally use dry wipes from Medline and soak in water because it’s soft and pure and natural, and what else could be better for baby? But when I go out and need a quick wipe because I can’t afford to take my time spraying the wipe with a peri bottle I keep in the diaper bag, I use Huggies wipes. Tried Pampers once and found it slimy whereas Huggies felt clean. I have no clue how many wipes may be affected but it appears more and more reports are coming in. Please check your wipes and post to Huggies as well as here so others may know. What line of wipe? What batch? What expiration? I was able to check my new case before BobaBaby started crying, and although I see that “shimmer,” it doesn’t feel like glass. I’ve also rubbed it over my hands, no itch. I have the natural care plus wipes with the circle pattern instead of the super cute duckies on clouds <–that was 90% why I chose to buy it so you can imagine how disappointed I am!! 1160 wipes and I can’t return it because it’s opened. But there would have been no way to know if I hadn’t opened it. Who knows how long before I can use it up too? I’m a boba drink addict. I love food, but there’s just something about that perfect cup of boba that stays with you and keeps you happy until the next one. Maybe boba is my coffee. I remember the days when I was pregnant, and luckily for me, it was a fairly easy pregnancy. No morning sickness, nada, none, zilch! Cramps? What the heck are those? Although I should say I must be one of the fortunate ones to rarely have cramps, if ever. I remember a friend whose cramps were so bad she wouldn’t be able to move and would be in tears from the pain and the migraines that came along with her period. And I would think to myself, “Really? Can’t be that bad….” But as I’ve grown up to realize, yes, for some people it is that bad. Anyway, aside from sciatic pain that would shoot down the legs and bring this pregnant woman to her knees, pregnancy was pretty uneventful for me–except this one time when I was thought I was going into labor but it was just gas. What a story that was! So, ladies, I know pregnancy is tough as we are going through it, but I can assure you that when it comes to food cravings, or boba cravings as in my case, those cravings are so much easier to satisfy when the little one is inside versus when he or she is out here. I used to be able to just get up and go–although as I hit my 9th month I usually had a friend come with, but I was able to go pretty much whenever I wanted, wherever I wanted. Now? Nope, not gonna happen. A crying baby in the car with no one else except me and I’m the one driving just isn’t going to work. So, boba drinks which used to be an every other day thing, became a once a week thing and then became an once every two week thing during pregnancy (no milk, 30% sweetness), is now a “who knows when” kind of indulgence. 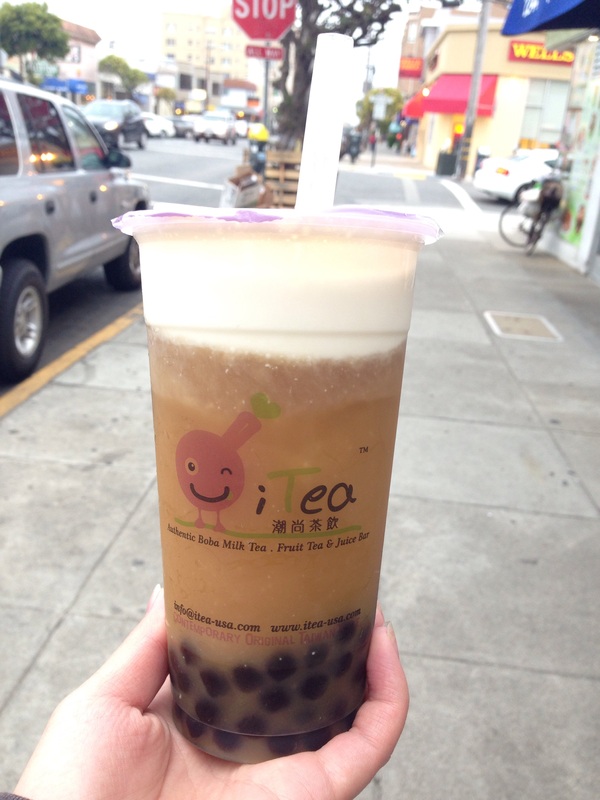 And you guessed it, it was a wintermelon crema, 30% sweet, no ice from I-Tea. I was really wanting to try something new, something different–but what if I didn’t like it? And there were so many things I wanted to try, like the hot ginger milk, or matcha smoothie with red bean, but I stuck with the wintermelon, simply because I had it before From I-Tea and it didn’t disappoint. I couldn’t very well risk my first trip in ages to get something I may not like! My favorite is actually Jasmine, but theirs isn’t good. We shall see what drink lies in store next time. Which To Sacrifice? Stay At Home or Go Back To Work? I’m faced with such a dilemma, and it’s been looming over me. Any advice and/or feedback would be greatly appreciated. I currently live with my in laws, and they are wonderful people, however, when it comes to my baby, they are too much and I don’t know how long I can tolerate being around them on a daily basis with them having near free reign to my child. The issue is that despite their good intentions (I’m assuming), we do not have the same parenting styles and I find them too possessive and overbearing of my child, which at many times, they seem to act like is theirs. Or maybe it’s just a clash of personalities. Oil and water are fine on their own, but now with baby here, oil and water just can’t mix. So I am faced with a dilemma: stay at home and raise BobaBaby with all the ups and downs of a new baby and lose my financial independence, or go back to work so BobaDad and I can afford to get our own home and move out faster? But that means leaving the precious baby in the crutches of the in laws during his most vulnerable and fundamental times of development. Which not to say is detrimental, but “if you want something done right, you have to do it yourself” mentality, and I really feel the first years are most crucial! And there is nothing wrong with having sitters, however, it is difficult being the control freak that I am to find someone who is a stranger that I’m supposed to trust with the baby. And say I do find this special someone, it will not be without cost. So then, is it better to spend the cost on a sitter while I go to work, or just do it myself? I’ve always been a do it yourselfer, and I don’t know if I would want to give up baby and me time to someone else. But it is probably more that I can’t and won’t be able to bring myself to hand over baby. And with getting a sitter will also be complicated in that it will be seen as a great insult to the in laws that we’d rather entrust our child–who in their minds is probably more accurately referred to as “their grandchild,” (because at times BobaBaby seems like he belongs to them more than he belongs to his actual parents)–than to family. Which then reminds me of a saying I’ve always found to be of wisdom: never do business with family. You really can’t make the same demands or “fire” them once they’re hired. What have those of you faced with a similar decision decided to go with? Give up career or place on hold to raise baby? Or continue career and have baby looked after by a sitter or family? Any advice? How did it go, would you do anything differently? And if faced with my situation, what would you choose? As a child, I’ve always said that when I grow up I would not be changing my last name. Before dating, this fact was made known: why waste time if this was going to be a deal breaker for someone? Years come and go and BobaBoy and I met, fell in love, and got married, and had a beautiful baby boy–now making us BobaDad and BobaMom. So anyway, a few days ago I was helping a friend update his Ok Cupid profile and the question came up about changing last names after marriage. His response: if she won’t change it, that’s a deal breaker. Naturally, being me, I was surprised. “Really? !” I asked, thinking he would say he was just kidding, but no, he was dead serious. Well, out of everyone I know, I am the only one to keep my last name, as well as my sister (although her reasons are different). It’s a little disappointing that even my friends who said they do not plan to change their names ended up doing so or hypenating. Some think I’m weird for not changing my name, I think it would be weird if I did. It’s the name I spent my life growing up with and is very much a part of my identity. It never occurred to me as something I would even consider: I love my name. Even if I did consider it, the new last name just didn’t sound good with mine. In the vietnamese culture, women kept their last names. Why bother with the hassle of having to redo all legal documents and paperwork. Seems so much simpler not to ever have to explain to someone who you are. Some argue it’s a feminist thing, and that it’s ironic and some even go as far to say stupid that women keep their last names when it belonged to a man. Well, let me just insert my thoughts here: you’re absolutely right in that it did belong to a man, but that was at one point in time, and it doesn’t change the fact that it was given to me and has become my name. So being that it is my name now, I am exercising my right not to have to change it to another man’s name. So, starting with me, it is now a woman’s name. Men (not all) are so full of themselves when they demand that a woman change her name when the thought of him ever changing his own is ludicrous. “Because it’s tradition,” they say. Or, “because that’s the way it is and has always been.” Well, just because something has always been a certain way doesn’t make it right. And I will keep my name for the pure reason that I simply want to. Do I love my husband any less? No. Does he love me any less? No. And men, please don’t ever argue: “if you love me you’d take my name,” because if you loved her, you wouldn’t make her. And on a similar note, if you love her, why don’t you be an even bigger man and take hers? But really, it’s not about whether a person keeps their last name or changes their last name, it’s about them having the choice and the decision from that choice being respected regardless of what it is. Whatever you choose, good for you!